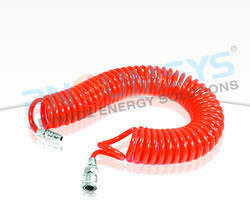 Our Recoil Hoses with coil memory which ensures they come back to their original shape after being extended, and are simple to store to help keep work area well organized. 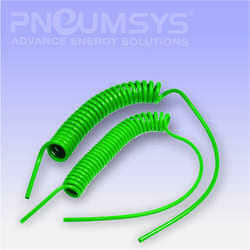 These are offered in nylon and polyurethane materials to give excellent flexibility for use in many work environments. NOTE The use of this typology of tube with continuous pulsating pressures can create heat accumulation, although it is particularly resistant to labour and tension flexions. Polyurethane is generally resistant to ozone, oils, fats, fuels and moderate chemical solutions. In isn't resistant, or low resistant, to concentrate acids ketons, esters, hydrocarbons, chloride. 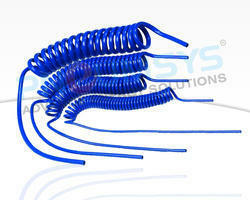 Spiral tubes 4x6, 5.5x8, and 6.5x10 have fittings 1/4' rotating with springs. 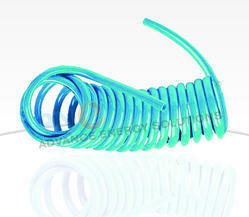 Spiral tubes 8x12 have fittings 3/8" with springs. The Use Of This Typology Of Tube With Continuous Pulsating Pressures Can Create Heat Accumulation, Although It Is Particularly Resistant To Labour And Tension Flexions. Polyurethane Is Generally Resistant To Ozone, Oils, Fats, Fuels And Moderate Chemical Solutions. In Isn't Resistant, Or Low Resistant, To Concentrate Acids, Ketons, Esters, Hydrocarbons, Chloride. good resistance to atmospheric agents, good aging, extremely resistant to fatigue, ozone resistant, excellent transparency, very high flexibility at low temperatures. NOTE The use of this typology of tube with continuous pulsating pressures cancreate heat accumulation, although it is particularly resistant to labour and tension flexions.Polyurethane is generally resistant to ozone, oils, fats, fuels and moderate chemical solutions. In isn't resistant, or low resistant, to concentrate acids, ketons, esters, hydrocarbons, chloride. 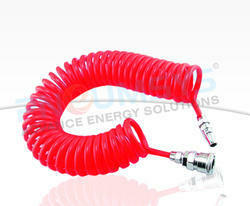 We are the leading supplier ofPolyamide Pa12 Calibrated Spiral Tubes Without Tangs. Very High Flexibility At Low Temperatures, Low Sensible To Click And Stress Cracking Effect Excellent Resistance To Abrasion Good Resistance To Atmospheric Agents, Good Aging, Extremely Resistant To Fatigue, Ozone Resistant. Note: The Use Of This Typology Of Tube With Continuous Pulsating Pressures Can Create Heat Accumulation, Although It Is Particularly Resistant To Labour And Tension Flexions. very high flexibility at low temperatures, good resistance to atmospheric agents, good aging, extremely re-sistant to fatigue, excellent transparency. I POLYURETHANE TRS 95 5.5X8 LOT/..MADE IN ITALY. a 23 DegreeC 50% r.h.
- good resistance to atmospheric agents, good aging, extremely resistant to fatigue, ozone resistant, excellent transparency, very high flexibility at low temperatures. The use of this typology of tube with continuous pulsating pressures can create heat accumulation, although it is particularly resistant to labour and tension flexions.Polyurethane is generally resistant to ozone, oils, fats, fuels and moderate chemical solutions. In isn't resistant, or low resistant, to concentrate acids, ketons, esters, hydrocarbons, chloride. NORMS : the raw material used to produce these tubes is according to: D.M 21/03/1973 and following modifying and integrations, Directive 2007/19/CE of Commission of 30/03/07, Reg. UE n. 10/2011 of Commission of 14/01/11, BgW recommendations. FITTINGS: The fittings are 1/4' rotating with springs. 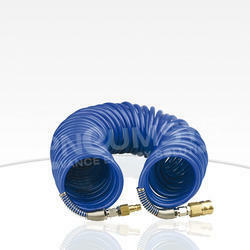 ISO 62 - a 23°C50% r.h.
FITTINGS: Spiral tubes 4x6, 5.5x8 and 6.5x10 have fittings 1/4” rotating with springs. 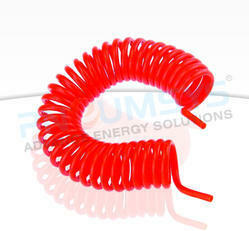 NORMS : the raw material used to produce these tubes is according to:Directive EEC 2011/65 (RoHS), eventual alimentary declarations of conformity about the raw material can be requested at the moment of the order. 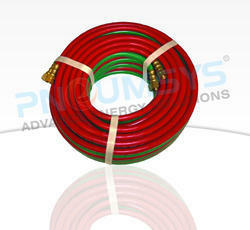 NORMS : the raw material used to produce these tubes is according to: D.M. 21/03/1973 and following modifying and integrations, Directive 2007/19/CE of Commission of 30/03/07, Reg. UE n. 10/2011 of Commission of 14/01/11, BgW recommendations.